Get Rid of Ants | No Exterminator Needed! The following article deals with the traditional DIY methods for getting rid of ants. Since the article was written, new products have come to market which are much easier to use and make ant control a very easy job. Look for a gel ant poison online or at a local store. What you are looking for is a Borax (Boric Acid) based tube of gel. Some good options are made by Maxforce, Optiguard, and 388B and cost around $30. These tubes are filled with a gel containing a small percent of Borax, which is highly poisonous. The remainder of the gel consists of a sugary substance which is highly appealing to ants. Squeeze small drops of the solution in different places along ant trails 1-2 feet from where the ants are coming from. The ants will find the bait and take it back to the nest where the entire colony will eat it. Over the course of a couple of days, it will kill the entire colony. This may take a few days and a few re-treatments may be necessary, but this method is cheap and highly effective. CAUTION: Do not use this around children or pets as the substance is toxic. The most important step in getting rid of ants is to identify what kind of ant you are dealing with. In the menu at the bottom or on the left, you can find links to general information about the most common types of ants that are generally considered household or workplace pests. Every species of ant has their preferred habitat, food, and behaviors and, as such, differing methods of control and extermination. That being said, there are some basic facets of ant control that are generally the same, regardless of the species of ant. This page will explain the basic ideas included in an ant extermination strategy and offer a number of solutions and home remedies that can be used to kill ants and clear nests. Ants multiply extremely quickly and a single nest can contain an extraordinary number of ants. The largest colony ever recorded had over three hundred million ants in it. This is, of course, an extreme, but a nest can easily contain tens of thousands of ants. Because of this, in getting rid of ants, we suggest an integrated pest control (IPC) strategy that includes ant control (killing ants), general cleanliness, eliminating ant food sources, nest & colony destruction, and prevention of further infestation. The two cornerstones of such a strategy are destroying the nest and getting rid of the reason the ants are coming to your residence (generally food). Having a large number of ants in your residence may not necessarily mean there is a nest in the house. The ants may have a nest in the building, or they may have a nest outside or even just near the building and come into it only to find food. It is important to find the nest and its proximity to your house when dealing with an ant infestation. The easiest way to find an ant’s nest is to follow a trail of ants collecting food from the food source back to the nest. Many ants forage at night and shining a flashlight on them will cause them to scatter. Ants are blind to red light, so use a red flashlight to follow an ant trail at night. When you have found the nest you will have to decide whether or not to invest in destroying it. If an ant nest is outside of your house and yard but you have ants in your house coming from the nest, cleaning your house, eliminating the ants’ food sources, and sealing your house to stop ants’ entry may be enough to get rid of them. In addition, ants play an important role in eliminating many other garden pests and getting rid of them can potentially case other issues. If, however, the nest is in or near to your house, we recommend destroying it to control the ants. Ants are extremely persistent and if a nest is near enough to your house, they will almost always find a way in. Destroying a nest can be difficult but, with the following techniques, you can either destroy the nest or cause enough damage to cause the ants to relocate. The most effective methods will kill the queen ant of the colony. The best results will be had using a number of techniques together. Dumping several gallons of different mixtures directly into a nest daily will not kill all of the ants inside of it, but will likely cause enough damage to cause the ants to relocate after several days. Be warned that most of these methods will also destroy surrounding plants and vegetation. Try mixing boiling water with dish detergent or lots of salt. In addition, you can use cider vinegar instead of water. Pour the mixture in slowly so it can work its way through the nest. Repeat daily for at least three days. Mix two tablespoons of Boric Acid with honey, jam, or jelly to create a paste. Spread the paste on a paper plate and leave it near the nest. Mix two cups of sugar, one cup of water, and two tablespoons of Boric Acid. Leave in shallow bowls around the nest and in areas of the house with many ants. Mix two tablespoons of boric acid with one cup of peanut butter. Spread on a paper plate and leave by the nest. Mix two tablespoons of boric acid with one cup of confectioner’s sugar and leave in small piles around the nest. Spray entrances to the nest and the entire nest area with an insecticide containing Bifenthrin. Repeat daily until there are no more ants in that location. Cinnamon works as an extremely effective ant repellant. After treating the ant nest with one or more of the aforementioned methods, sprinkle cinnamon on, in, and around the nest to get any remaining ants to relocate. If you are experiencing an ant infestation, there is always a reason why. Ants generally enter a residence or workplace because they have found food sources there or they have found it to be a suitable breeding ground. Unlike, for instance, bed bug infestations, an ant infestation is often a sign of a lack of cleanliness. Keeping clean and finding and eliminating food sources is an integral part of an ant control strategy. So long as there is a reason for the ants to return, they will do so. Follow ant trails through your house to see where they are going and what they are doing there. Are they all around the sink? The pantry? The trash? 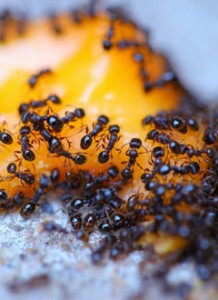 Once you have identified the areas the ants are going to and what they are eating there, take care of the problem area. Sweep up food crumbs and spills. Take out the garbage and clean the dishes. Sweep, vacuum, and mop the floors. Make sure all your open food is either in the refrigerator or sealed in airtight containers. Throw out half eaten bags of snacks or seal them in Ziploc bags. Clean out the sink and incinerator and wipe down all of your counter-tops in the kitchen with a cleaning solution. The cleaning solution will help to erase the scent of ant trails and keep them from returning. Spray a mix of one part water one part vinegar in a circle around the bowl. This will deter ants from getting to the bowl. Fill a shallow plate with water and place the food bowl in the center of the plate, effectively creating a moat. This way, your pet will still be able to get at their food, but any ants trying to do the same will drown on the way. The most important elements of an ant control strategy are destroying nests and eliminating food sources. However, it can also be helpful to stop additional ants from making their way into your home. The following prevention methods won’t take care of ants that are already in the house, but they will stop more ants coming in from outside. It is important to consider which methods you use as certain ones can interfere with others. For instance, if you have left baited poison inside your house for the ants and then you ‘seal’ the entrances to your house with insecticide, the ants that pick up the baited poison will not be able to bring it back to the nest! Most of these methods should be used only after you have completed the previous sections (eliminating the food source and destroying the colony). Ants send scouts to search for food. The scouts leave a trail of pheromones behind them so that they know how to get back to the colony. If a scout finds food, it returns to the colony and leaves a different scent of trail on the way back. Worker ants pick up on that scent and follow the trail to the food supply. Erasing the trail will stop more worker ants from following, as they will not know where to go. Mix three parts water with one part vinegar and place in a spray bottle. Clear the trail of ants and then spray the area down with the mix. This will erase the scent trail. Spray an indoor insecticide on places where ants enter the residence (windows, doors, cracks in walls, etc.). Be careful and read all labels properly as ant poison can be poisonous to pets as well. Seal cracks or holes in walls where you suspect ants may be entering from. Trim plants and trees that touch your house so that there is a gap of at least a few inches between the plant and the house. Ants often make it indoors by using trees and bushes as ‘bridges’ to get in. Contrary to what you may think, killing ants is one of the least effective ways to get rid of ants. If you have an ant infestation, there may well be thousands of ants in and around your home. The most effective way to get rid of ants is what has been described in the previous sections. However, the following methods are all useful for killing ants that have already entered your home. Kill ants in your yard by mowing the lawn and then spraying a ‘lawn and garden’ insecticide on the mowed grass. Spray around trees, plants, and generously on visible anthills. Vacuum ants and ant trails that you can see. As soon as you have finished, vacuum some talcum powder or Diatomaceous Earth. Both of these powders will kill all of the ants that are in the vacuum machine. Be sure to do the second step or, alternatively, dispose of the vacuum bag far away from your home. Use a ‘Bug Fogger.’ Bug Foggers release fumes that are fatal to insects including ants. They can remain effective for several months. Be sure to read labels carefully and to follow the directions as foggers can be harmful to people as well. Following the directions in this page will help you get rid of the vast majority of ant infestations. If you know what kind of ant you are dealing with, then you can get more specific tips. For instruction on how to get rid of specific types of ants, check the links below.